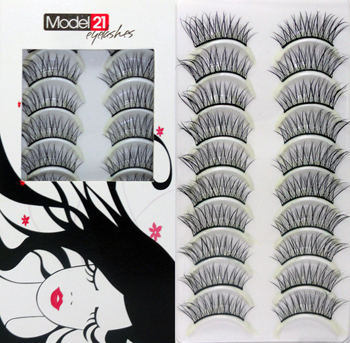 Model 21 False Eyelashes are made from sterilized human hair for the most natural look. The eyelashes are handmade to exact specifications, thus making them extremely light and comfortable to wear. Each design is perfectly shaped and arranged to give a new look to your eyes. Whether you are going for a natural or dramatic look with your eyes. The eyelashes are long, which allows for them to be cut and shaped to fit the contour for you eyes.